HILO, Hawaiʻi - There was a sign waving outside the Hilo State Building on Wednesday, in support for organizations who went to the State Capitol to make their voices heard. Jim Albertini holds a sign in the foreground, outside the Hilo State Building on Wednesday. 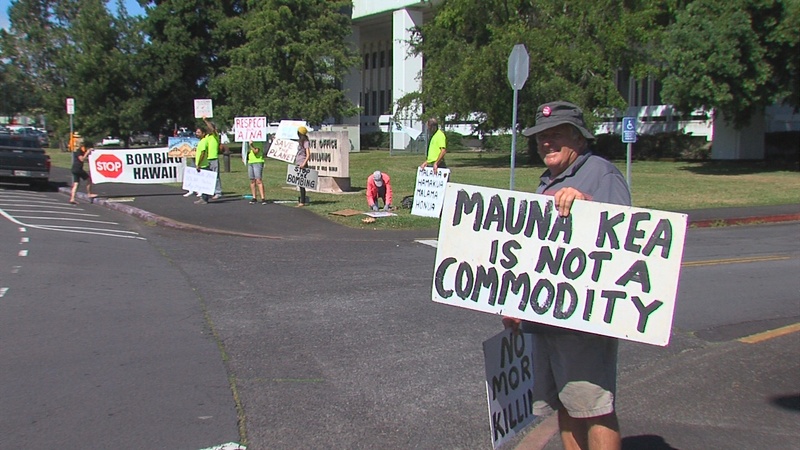 (BIVN) – Activists waved signs outside the State Building in Hilo on Wednesday, marking the opening of the 2019 Legislative Session. At the State Capitol on on Oʻahu, thousands were expected to attend the Aloha ‘Āina: Ma Uka to Ma Kai (from the mountains to the sea) Educational Rally, in collaboration with the Kuʻi 2019 event at the opening of the legislature. Outside, an above-ground imu cooked the kalo that was to be pounded into poi later on. On the Big Island, Honokaʻa resident Phaethon Keeney said the groups participating in the Hilo gathering included Malama Hāmākua, 350.org, and Extinction Rebellion, along with other aloha ʻāina advocates. In his opening day remarks, Speaker of the House Scott Saiki told fellow representatives that, when crafting legislation, the Legislature needs to “view circumstances through the lens of those who are impacted by them,” he said.